Horsehair pottery has come to a lot of potters' attention in recent years. This technique does indeed use hairs from horses; the idea is to burn the hairs on the pot's surface to create lines. As hair is laid upon glowing hot pots straight from the kiln, they sear onto the pot's surface and will leave localized carbon markings. The pottery piece is formed, then burnished. Burnished pottery works best, as the smooth unglazed surface accepts the carbon marking with the strongest effect. The piece is fired to between 1300 F and 1800 F in a raku kiln. Using the raku kiln allows much easier access to the ware. Once the correct temperature is reached, the incandescent pottery is taken from the kiln using long raku tongs and proper gauntlets and other protective gear. The hot pottery is placed on a non-flammable surface (such as a piece of broken kiln shelf) and the selected hairs are draped onto it. Once the piece has cooled completely, it is washed to remove residue. It can then be waxed to bring out the markings. 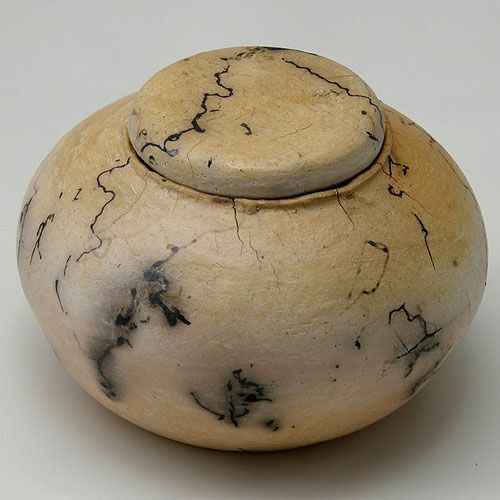 Horsehair pottery requires a porous ceramic body in order for the carbon to permanently mark the surface. Due to this, the best clay bodies to use are also the same as are best for raku. Such clay bodies should contain at least 15% grog and may include up to 40% grog. Such a clay body is often rough and almost impossible to burnish if left "as is." In order to get that lovely smooth, buttery burnished surface, cover the piece with terra sigillata. Another aspect to note is that horse hair pottery should never be considered functional ware. It is not food-safe and is also liquid permeable. Horse tail hairs produce thicker, stronger lines on the pottery, as they are coarser than mane hairs. Horse mane hair produces finer, more subtle lines. Feathers and long, coarse dog hair have also been used, creating variations of pattern. Human hair tends to be much too fine; however, use of a braid of hair might be worth investigating. Each pottery piece will generally use only ten to twelve horse hairs. Using more than this reduces the visual impact of the finished piece. Using a high-speed rotary tool to lightly carve designs through the surface markings in areas.